Combine staff photos with your seasonal greetings! Very similar to our Photo and Text E-Cards, this style of e-card combines text, your staff photos, and a complimentary audio track. Each of these e-card templates includes your logo and corporate colors. 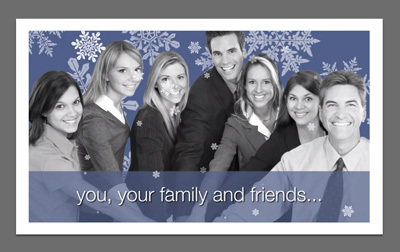 Customizable e-card solutions designed to incorporate photos of staff and employees. Below, you'll find some samples of our templates available. More ways to use your staff photos! Personalization Slides in our Slideshow E-Cards are fantastic for staff photos too! 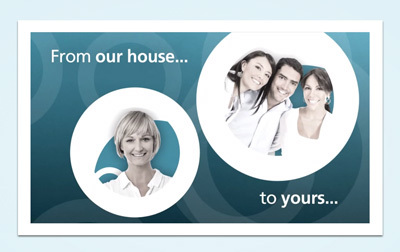 Add staff photos to any ecard with e-card insert add-ons. 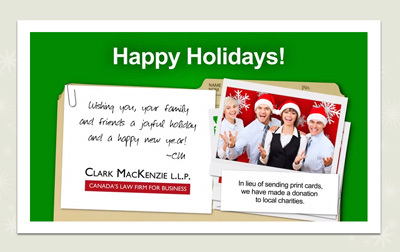 Receive a sample Staff Photo E-Card! 1 Your staff photos will be edited to include the template's custom photo background. In order for it to be included, photos of your staff must be taken in front of a green/blue screen and use sufficient lighting. Without these, we may not be able to use the template’s photo background. Use of the template's photo background is not required. Here's the current pricing for a Staff Photo E-Card.